Trim as much visible fat as you can from the pork. Cook on low for 8 hours or high for 4-5 hours, or until pork shreds easily with a fork. Remove pork from crockpot to a large bowl and shred pork with 2 forks. Dump most of the liquid in the crockpot out and return the pork to the slow cooker. Add barbecue sauce to pork, stir to mix and cook on low until heated through. 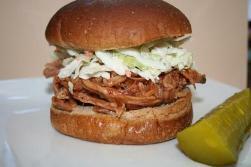 Serve immediately on hamburger buns with cole slaw and pickles!